Keep your congregation safe during critical events and better manage community communications. In recent years, attacks and threats against houses of worship in North America have increased sharply. Churches, synagogues, mosques and faith-based communities have special needs to consider when formulating a communications plan. With Regroup Mass Notification, ushers and security staff have a powerful tool to hedge against the threat of a violent incident. Regroup enables security teams to collaborate quickly and securely in the event of a crisis, ensuring a safer congregation. 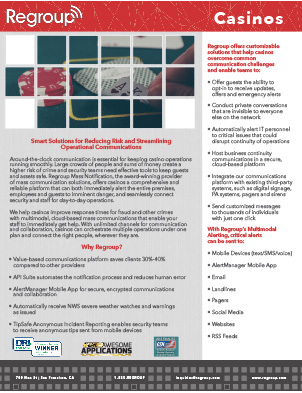 Regroup’s encrypted two-way communication and QuickConference features allow you to easily communicate your status and instruct your team on next steps. With Regroup’s exclusive TipSafe Anonymous Reporting feature, network members can securely report suspicious activity or threats against the congregation or establishment. Regroup’s day-to-day functionality make planning and staffing a snap. Use it to coordinate maintenance, special services, community functions and more. With Regroup, you’ll know your message was received. Combine Regroup’s broad range of features with our 24/7 client support and unlimited client training, and you have a communication solution you can rely on. As one of the most trusted names in mass notification, Regroup is the preferred choice of houses of worship throughout the United States. Regroup helps houses of worship maintain a higher level of safety for congregations and staff and provides a secure, reliable solutions for a wide variety of community communications. Regroup for Houses of Worship – our fact sheet shows why a mass notification system is an essential tool for churches, synagogues, mosques and community centers.